Hardcover New and Signed First Edition. Dust jacket is in fine condition. First Editions also available – contact the Bookshop. 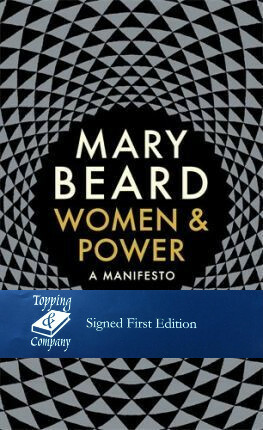 Britain’s best-known classicist Mary Beard, is also a committed and vocal feminist. With wry wit, she revisits the gender agenda and shows how history has treated powerful women. Her examples range from the classical world to the modern day, from Medusa and Athena to Theresa May and Elizabeth Warren. Beard explores the cultural underpinnings of misogyny, considering the public voice of women, our cultural assumptions about women’s relationship with power, and how powerful women resist being packaged into a male template.